Artscroll Sapirstein quotes Be'er Mayim Chayim to say the measures should not be taken literally. This just shows that mountains have more arable land than plains. Can someone explain this please? Is it just geometry or is it productivity? The simplest example of this in 3D is that the surface area of a hemisphere is double the surface area of a flat circle, so if you grow things on the surface you have double the area (wikipedia.org/wiki/Sphere). Obviously, this is just a simple example to illustrate the principle. If you wanted to get exactly 5 Kor, then the height of the hill should be roughly three times the radius (alternatively, the shape of the hill needn't be a perfect hemisphere). 1) So instead of solving it all ourselves, let's just use the following area of ellipsoid tool. You find that if you put "1" as the a,b,c axis, you get a surface area of 4*pi. This is in line with what we know about a unit sphere -- the total surface area is 4 times that of a circle of the same radius. 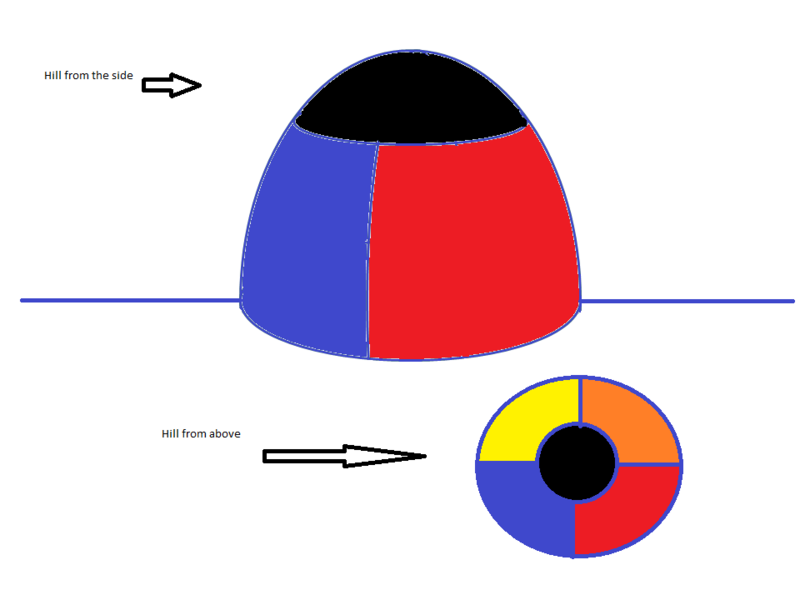 --> Thus, if I had a hill shaped like a hemisphere, it would have half the surface area of a unit sphere, in other word, exactly double the area of a circle with the same radius. 2) Next, set a=1, b=1, c=3.1. You'll see that the total surface area of the elongated ellipsoid is 31.76, or roughly 10*pi (you can find the height to get exactly 10*pi if you wish). As before, if half of this was a hill sticking out of the ground, it would have a half the surface area of this ellipsoid == 5*pi, or five times the area of a circle with the same radius. 3) If you get all this, then it should be obvious to you that there is some line, where the area of the ellipsoid above it has a surface area of pi (or exactly the area of the circle). I define this as "the summit". The area below, I split into 4 equal part. By construction, each of those part will also have 1/4*(4*pi)=pi surface area. "The summit" is defined as everything in black, and each of the sides is a different primary color (yellow, red, orange, blue". Since the total surface area of the hill is 5*pi, and I have drawn a line such that the black area is exactly 1*pi, the remaining area (4*pi) is split into 4 equal parts of 1*pi each. Not the answer you're looking for? Browse other questions tagged parshanut-torah-comment rashi geography agriculture ekev . Why was the torah given on a mountain?